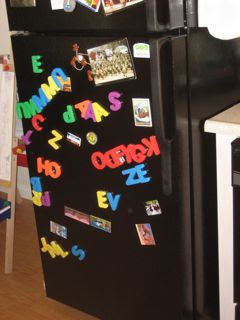 Thank you to everyone who had suggestions for where to get large magnetic letters. Julie's comment led me to what I wanted on Amazon, but their shipping time was longer than I wanted. But then I thought- "Duh! I should go to a teaching supply store." Which is what I did on Saturday. 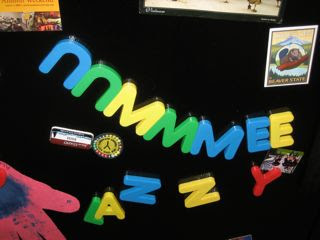 Pumpkin is thrilled with her new letters. And also with the new book and CD I bought. All I can say is that teaching supply stores are dangerous places for mothers fighting off colds and looking for things to keep active little toddlers occupied with minimal adult energy expenditure required. I narrowly escaped without purchasing a new puzzle, which I'm sure Pumpkin would also love but wouldn't have been necessary since the ones she already has are still occupying her just fine.